If you're new to high resolution audio, we suggest downloading the 44.1kHz WAV album in the column on the left. This format will play in iTunes without additional setup. Provenance: Recorded and Mixed to 96kHz, 24-bit WAV PCM. The 9624 WAV files (9624 is our shorthand for 96kHz, 24-bit encoding) are the original digital file generation received from the artist or label. The DSD and FLAC files are considered second generation and made from conversions using our Blue Coast conversion methods. DSF and FLAC will offer the convenience of metadata that the WAV files may not. After several blindfold tests, it is our opinion that the 9624 WAV files sound the best, followed by DSF and FLAC 9624. The difference is minimal. We suggest you purchase files for your best performing home DAC. The DAC will make more difference than the file type. Files are delivered immediately after payment and links are also sent via e-mail. If you have any questions about your order please contact support. JRiver Media Center, Channel D's Pure Music and Audirvana Plus. 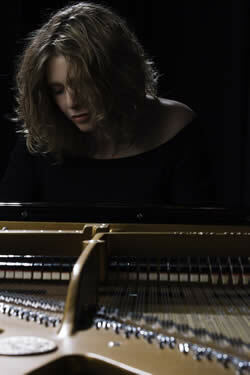 Fiona Joy Hawkins is a composer and pianist whose music is best described as Transcultural Instrumental. An ARIA Finalist in 2009 for Best World Music Album and winner of the 2008 Music Oz Awards for Best Jazz or Classical Artist, Fiona also won Best Piano NAR Lifestyle Music Awards 2006 and Best Dance Dub/Club 2008, and has been a finalist in over 37 Indie Artist Awards across 9 countries. Her latest album, BLUE DREAM, received the highest ever ranking in the history of the New Age Reporter International Radio Charts, debuting at #1 and went on to win the ZMR Album of the Year, Best Piano Album and Best Contemporary Instrumental Album. Fiona now has over 43 Awards and nominations across 9 countries. Crossing genres from Classical to Jazz rhythms, world influences and New Age mysticism, Fiona has had the good fortune to work with many incredible artists including Will Ackerman, Luka Bloom, T-Bone Wolk (Hall & Oates), Heather Rankin (Rankin Family), Jeff Haynes (Pat Metheny), Eugene Freisen (Paul Winter Consorte), Paul Jarman, Dave Ellis, Rebecca Daniel and world renowned Mongolian Throat singer Bukhu. Her musical influences include George Winston, Michael Nyman, Chopin and Mendelssohn, but she also admits to being a “bit of a folkie” in her free time. Classically trained as a pianist, Fiona's music is thematic and melodic. With a keen eye on film she has always been interested in creating music that evokes images and emotions and tells a story. Fiona first began playing and writing music as a child and cites Ravel's Bolero as an early influence. "I played this over and over and deconstructed every part, I absolutely loved it," said Fiona. Other musical influences include: George Winston, Michael Nyman, Chopin and Mendelssohn. The family home was filled with music. "My father played Jesus in the Tamworth Musical Society production of Jesus Christ Superstar, Andrew Lloyd Webber's music was part of our lives." Discovered by Will Ackerman in 2008 after winning Album of the Year in the NAR Awards on a keyboard and from a field including George Winston, Fiona had the opportunity to travel to Vermont to record an album at his Imaginary Road Studios. Fiona Joy Hawkins’ BLUE DREAM began as the most ambitious project of my entire career and resulted in one of the most remarkable collaborations this genre has ever known. Blue Dream is unique and I’m as proud of it (and Fiona) as anything I’ve ever worked on in my 35 year career of Grammy Awards and gold and platinum records." Blue Dream represents the very best of this music genre and follows in the great tradition of artists such as George Winston. This beautifully crafted album has already been hailed in the US as a work of pure genius."